Members of the Brandeis community are invited to visit the Brandeis Library's Meditation Room on the Goldfarb Mezzanine, near the Library Administration offices. The room is furnished with some equipment, including yoga mats, prayer rugs, and zafu meditation cushions. 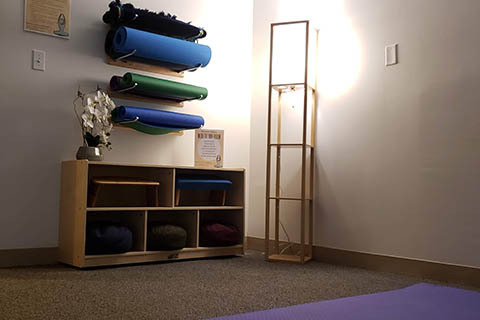 The Meditation Room is intended for meditation, prayer, mindfulness, and finding a moment of peace. Please follow the guidelines to respect others using this space. Cell phone should be on silent. Music or guided meditation audio is permitted only if your use of headphones does not disturb others. This space is intended for meditation, prayer, mindfulness and finding a moment of peace. Please do not use it to study, hold group meetings, eat a meal, or nap. Food and beverages are strongly discouraged. Water is OK. Please be aware and respectful of the personal space of others. Place backpacks out of the way. Don’t expect others to disturb their meditation to accommodate you. Be willing to rearrange to accommodate others. Leave the room as you found it, if not better. Please don’t remove any equipment (but do return anything you borrowed at the desk). Please don’t leave a mess (and please put equipment away). Please no strong scents (e.g., oil diffuser, lavender relaxation pillow, scented lotion, etc.). Please direct questions, concerns, or feedback to the Information & Borrowing Desk, in-person on Goldfarb Level 1 or by email at borrowing@brandeis.edu.